A 208-story skyscraper will loom over the rural outskirts of Changsha by next April. On the heels of the news that the world’s largest building opened on July 1 in the southwestern Chinese city of Chengdu, a similarly grand architectural plan is now underway in the nation’s south. On Saturday, Broad Sustainable Building chairman Zhang Yue announced that the firm’s Sky City tower, situated on the outskirts of the city of Changsha in China’s Hunan province, will be completed by next April. Once the 208-story skyscraper is complete it will officially register as the tallest building in the world. At present, the world’s highest structure is Dubai’s Burj Khalifa at 2716.5 feet. Sky City will stand 2739 feet, with a price tag of a staggering 5.25 billion yuan ($855.7 million). The project is a natural progression for ambitious Chinese developers. As The Telegraph points out, mainland China is already home to four of the world’s nine tallest buildings, while a fifth, the International Commerce Centre, rises 1,588 feet above Hong Kong. 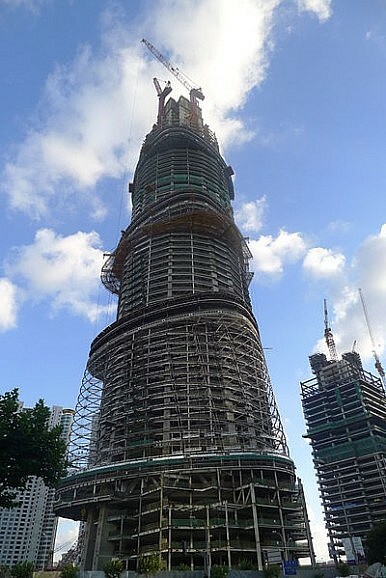 Shanghai Tower is also slated for completion next year. At 2073 feet, it will fall just behind the Burj Khalifa in the list of the world’s loftiest structures. While it took five years to erect the Burj, the project to assemble Sky City will be completed with unprecedented speed by using a game-changing technique that revolves around assembling prefabricated large sections of the structure off-site, then assembling them in larger pieces on site, Lego style. The firm used the technique to put up a 30-story building in 15 days in 2011. In a country where housing, real estate prices and a massive population’s environmental impact are ongoing concerns, Sky City’s 1.6 million square meters of space will be put to good use. Under the 202-story aboveground complex will be six underground levels. The structure will house apartments, shopping malls, a hotel for 1,000 guests, schools, theaters, and a hospital – even a “vertical farm”. The building’s 31,400 residents have to eat, after all. This vertical lifestyle will purportedly result in residents using only one-hundredth of the average land area per person, and only 2 tons of CO2 compared with the per person average of 5.5 tons. Residents will have the option of getting around on elevators or walking along the building’s six-mile long ramp, which goes from the first to the 170th floor. “Sky City will take some 2,000 cars off the road simply because its residents can find most of what they need right where they live,” added Zhang of Broad Sustainable Building. Still, with China’s flood of urban transplants, what’s a developer to do? A promotional video for the ambitious project can be seen here. Editor's note: The text has been updated from the original version. This weekend Shanghai Tower’s main structure will be capped in a ceremony.